Neither Tweet directly states that Israel was responsible, but of course anyone with experience of the terminology used by the BBC in its reporting from Gaza during the past four weeks (and in general) would know that only Israel “strikes”, “pounds” and “bombards” according to the BBC lexicon. “At least 10 people have been killed in a strike near a UN-run school housing Palestinians displaced by the Gaza conflict, medics say. “In the latest attack, eyewitnesses said a missile struck as people queued for food. 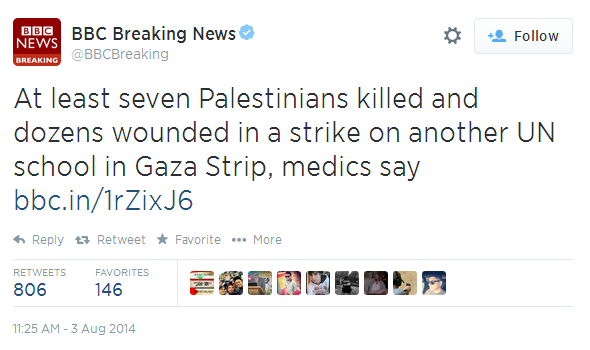 At least 30 people were also hurt, Palestinian officials said. Images showed injured children being carried away. Apparently Mr Turner (and the BBC) has yet to watch the recent interview with former UNRWA official John Ging – now the director of the Office for the Coordination of Humanitarian Affairs of the United Nations. Clearly Turner has also yet to see the latest example of mapping of mortar fire from the vicinity of a UN school in the Zeitoun district of Gaza City on August 2nd. In other words, BBC television audiences and visitors to the website are being told in no uncertain terms by Patience that not only was this incident an intentional Israeli attack “on” a UN school, but also that Israel UN schools have been the target of Israeli attacks twice before. 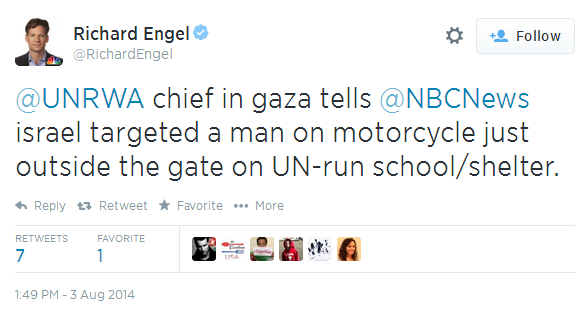 “Chris Gunness, spokesman for the U.N. Relief and Works Agency, tweeted that the school was sheltering almost 3,000 internally displaced people. 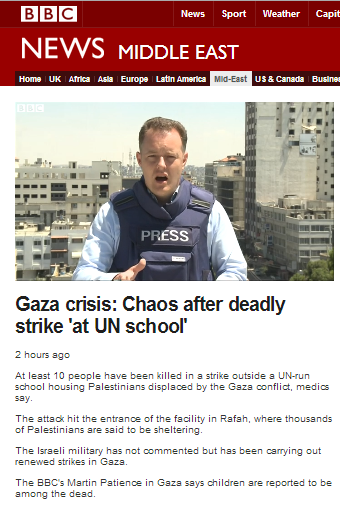 The incident is currently under IDF investigation but already the various BBC claims of an attack “on” or “at” a UN school in Rafah – rather than in the vicinity of that building – are clearly less than accurate and Martin Patience has obviously breached BBC guidelines with his knee-jerk claim of a “third deadly attack on a United Nations school” by Israel. Unless he can prove that this school itself (along with the other two he mentions) was the intended target of an attack – rather than terrorists operating in the area near those UN schools – the BBC should issue a prompt and prominent correction. bbc uses a hitlerian,nazi terminology whereby each word is a PRESSURE on Israel which “if you do not SUBMIT to my will I shall destroy you! Fortunately the bbc has not the power to destroy Israel,just to bark,squeak,howl,yell…they belong to the zoo where their patron hitler should have been locked up! 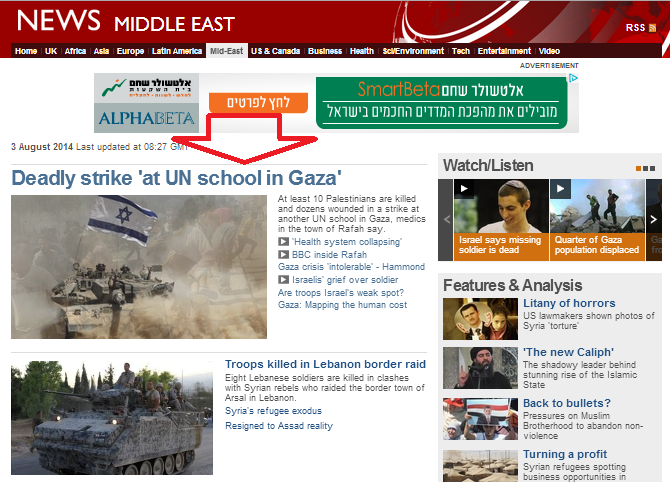 Today’s Times is no better with the headline: “Israeli airstrike kills ten at UN school in southern Gaza Strip”. But then they probably pick up their news from al-Beeb. Perhaps if the UN didn’t condone the use of their schools as both weapons bases and indoctrination farms, we wouldn’t have this problem. When will the media hold the UN to account? escritor pero sigo siendo nuevo en todo . ¿Tiene alguna puntos para escritores de blogs? 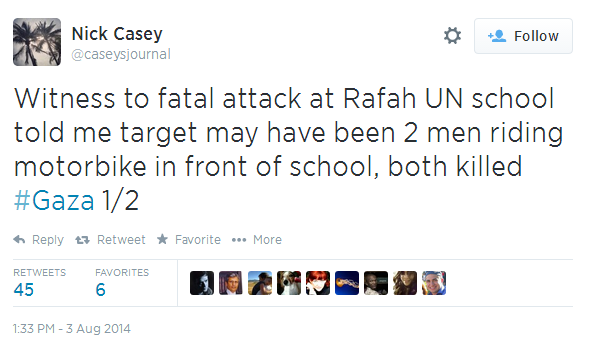 Martin Patience has been doing a good job reporting from Gaza. 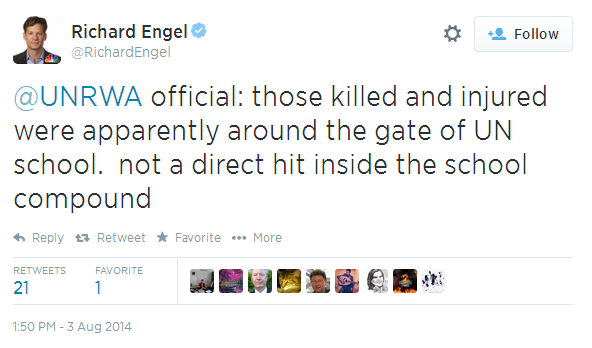 The BBC needs journalists like him – reporting events as they are. 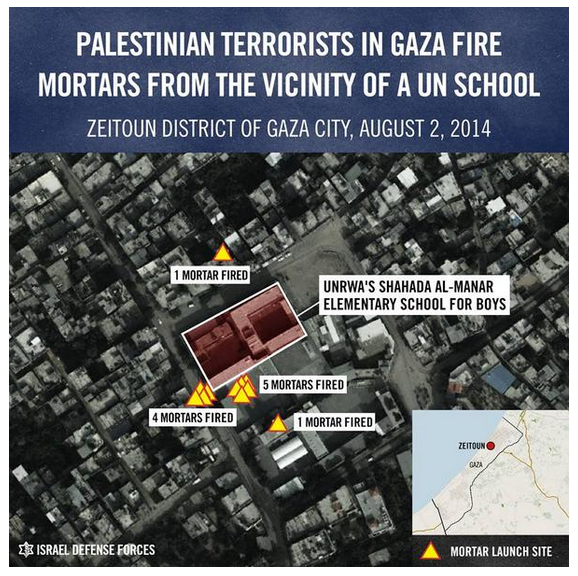 This brilliant blogger shows this ‘school bombing’ to be just another bit of Pallywood. As well as another instance. Somehow I doubt the BBC will be correcting the perception of the public to make this clear.